Product Details: Maximum Strength Herbal Diuretic. Rapid Water Loss. Reduces Bloating. Supports Weight Loss. 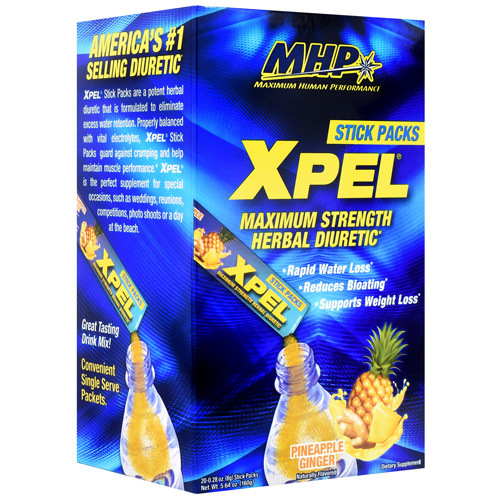 For Over A Decade, Millions Of Americans Have Chosen Xpel To Help Them Shed Unwanted Water Weight Fast. This Unique Formula Works To Rapidly Reduce Bloating And Support Weight Management, Making It The Perfect Supplement For Special Occasions. Rapid Water Loss and Muscle Definition. Reduces Bloating and Supports Weight Management. Replenishes Electrolytes For Reduced Cramping And Optimal Muscle Performance. Perfect For Men and Women. America's #1 Selling Diuretic. Xpel Stick Packs Are A Potent Herbal Diuretic That Is Formulated To Eliminate Excess Water Retention. Properly Balanced With Vital Electrolytes. Xpel Stick Packs Guard Against Cramping And Help Maintain Muscle Performance. Xpel Is The Perfect Supplement For Special Occasions, Such As Weddings, Reunions, Competitions, Photo Shoots Or A Day At The Beach. Great Tasting Drink Mix! Convenient Single Serve Packets. Other Ingredients: Maltodextrin, Citric Acid, Natural Flavors, Ammonium Chloride, Guar Gum, Ginger Root, Silica, Sunflower Lecithin Emulsifier, Sucralose And Beta-Carotene (For Color). Directions: Mix 1 Stick Pack With 12-16 Fl Oz Of Cold Water Until Dissolved. For Maximum Water Loss: Consume 2 Servings Daily, 1 in the Morning and 1 in the Afternoon. Drink At Least 6-8 Glasses Of Water Daily. Do Not Exceed 2 Servings Daily. Warnings: Keep Out Of Reach Of Children. Do Not Purchase If Seal Is Broken. Protect From Heat, Light, And Moisture. Store in a Cool Dry Place. Caution: This Product Is Strictly Intended For Use by Healthy Persons 18 Years of Age or Older. Contains 75 Mg Caffeine Per Serving. Caffeine Intake Is Not Advisable In Cases Of High Blood Pressure, Heart Problems, Pregnancy Or Nursing. Do Not Combine With Use Of Caffeine-Containing Medications, Foods Or Beverages While Taking This Product Because Too Much Caffeine May Cause Nervousness, Irritability, Sleeplessness And, Occasionally, Rapid Heartbeat. Do Not Exceed Recommended Dose. For Adult Use Only.